Burke International Tours Travel Agency, providing travel opportunities for individuals. It all started in 1976 when Catawba County native Udean Burke was Minister of Music at Merrimon Avenue Baptist Church in Asheville, North Carolina. He and his wife Nancy were celebrating their twenty-fifth wedding anniversary with their dream trip to Hawaii. After talking to friends from church they got a group of sixty-seven people together and went on that dream vacation. On the tour several of the ladies were bragging about what a wonderful group of Christian people were on the tour with such a great atmosphere. Some of the ladies had been on bus tours before and were embarrassed by the jokes and language and were uncomfortable with the incompatibility of the people on the tour. They wondered why they couldn’t get the same kind of people that they had on the Hawaii tour to go on a motorcoach tour and share a Christian atmosphere with great fellowship with family and friends. After a nice organized tour to Hawaii Nancy and Udean talked about planning a motorcoach tour…and they did just that. Their neighbor just happened to be a driver for Trailways. They chartered a motorcoach from Trailways driven by their neighbor and toured the Amish Country of Pennsylvania, Washington, D.C., and Williamsburg, Virginia. With a group of thirty-nine people they had a successfully organized tour. After this tour people started talking about what a great trip they had and suggested other place to take tours. With these ideas they mailed out a small brochure promoting several other upcoming tours. With more and more people finding out about Nancy and Udean’s Christian Tours, a new business was now formed. By 1977 their daughter Mellonee, now owner of the company became the secretary, making reservations and handling many office tasks. Nancy, Udean and their son Tim were the tour directors/escorts on each of the tours. Continuing to charter motorcoaches from local companies Christian Tours began to offer a more variety of fully escorted vacations. 1982 was a big year for the Burke family! Making a decision to move back to Catawba County and the purchase of the first vehicle in the fleet was made, a brand-new Prevost motorcoach. Now with almost 40 years in the travel business, Christian Tours / Burke International Tours now operates a fleet of 49 full-size 52 to 56 passenger Prevost H345 Motorcoaches and 10 Mini-Coaches; the business continues to grow. The vehicles are available for charter to businesses, major events, schools, churches, special events, shuttle, etc. Our company also owns and operates two other divisions Burke Educational Travel and Burke International Tours Travel Agency. With the Christian values of the company, the company is still owned and operated by Mellonee Owenby, daughter of Nancy and Udean Burke who both recently passed away. Heather Paul and Melissa Jones, granddaughters of the Burkes, are an integral part of the business. The company employs 150 full time and part time employees. 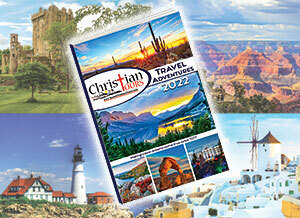 Travel with other adventurous and like-minded people on an unforgettable vacation with Christian Tours. Christian Tours has been operating escorted motorcoach tours for over 35 years. We are conveniently located in North Carolina near major cities such as Charlotte, Winston Salem, and Greensboro and just a short distance to South Carolina. Our escorted tours are fun-filled, family friendly vacations. It is easy to join us. We travel to sights all across the United States and Canada. We also offer International & Domestic Fly tours including scenic and exciting destinations.